From I-44 Exit #44: Turn north. Follow business loop to Highway 39 North. Turn left. Follow Highway 39 North (S Spring Park Blvd), pass over the bridge and up the hill. Turn left before the white water tower, Breckenridge Rd. Stay to the right. We are the blue building on the right. From I-44 Exit #46: Turn toward the truck stop. Continue on the business loop through both stoplights, to Highway 39 North. Turn right. Follow Highway 39 North (S Spring Park Blvd), pass over the bridge and up the hill. Turn left before the white water tower, Breckenridge Rd. Stay to the right. We are the blue building on the right. From I-44 Exit #49: Turn right (west) on Highway 174. Go approximately four miles to the stop sign, bringing you to Highway 39. 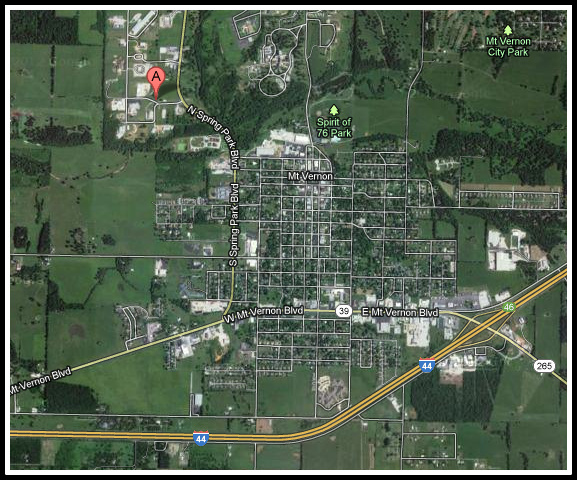 Turn left (south) on Highway 39 (N Spring Park Blvd) and go approximately one mile. Turn right, after the white water tower, Breckenridge Rd. Stay to the right, we are the blue building.